Why Brahma Is Not Worshipped? I answered this question before, but I keep thinking about it and finding new answers. There are many reasons why Brahma is not worshipped like Vishnu, Shiva, or Shakti in Hinduism and why he does not have many temples to his credit. Previously, in my book Brahman and elsewhere I suggested that one of the reasons for his lack of popularity was the decline of the original Vedic Kshatriya kings, who used to worship him. The main reason why his major temple is located in Rajasthan is because it was originally the land of the Vedic Kshatriyas (popularly known as Aryans), or the land of the Sindhu Saraswathi region where the kings of the lunar and solar dynasties ruled. With the decline of their power, Brahma also lost his exalted status as the god of pure mind and intelligence. However, I believe there is still a deeper reason why devout Hindus do not worship him with the same fervor as they worship other gods. Ironically, Saraswathi, his consort, has more devotees than him and is more popular. Many local deities and Shaktis have greater devotional appeal than Brahma, who is one of the Trimurthis, and who on that status alone should have received more attention and respect than many. 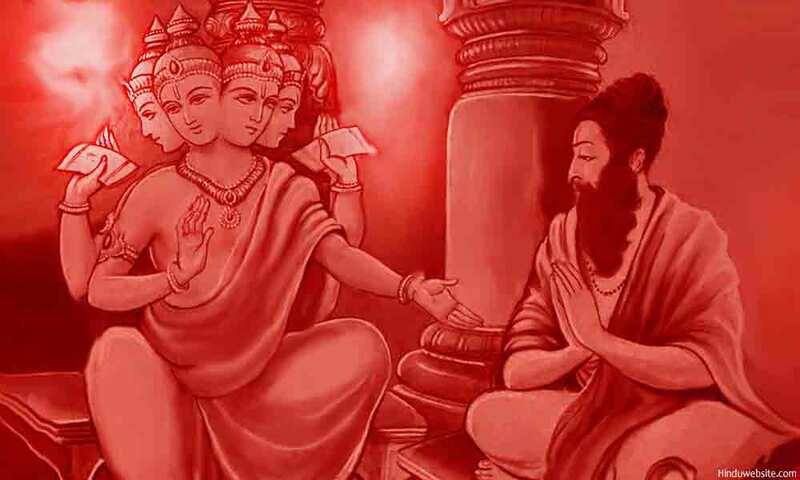 The Puranas suggest that Brahma was cursed, but it is not the only reason. The truth is Brahma was never worshipped devotionally, and the tradition continues even today. To understand why it is so, we have to go back to the early Vedic period, when Vedic culture thrived on the banks of the River Saraswathi, along with other cultures such as those from the Indus Valley civilization. We do not know from where the Vedic people came. We know that some of them in that community were called Aryans (Sanskrit: Aryas), who constituted its nobility and acted as rulers and hosts of sacrifices (yajamanas). They nurtured the gods in heaven and the gods upon earth (Brahmanas) through offerings, gifts, and sacrifices. The gods of both spheres in return protected them from evil, natural calamities and enemies through their blessings and gratitude. It is wrong to believe that Hinduism originated from Vedic religion only. It is also wrong to look for all answers and historical truths in it only. Several streams of religious and philosophical belief systems contributed to its expansive growth. Along with Vedism or Brahmanism, there were at least three other main traditions of ancient India, namely, Shaivism, Vaishnavism, and Shaktism, which are now a significant part of Hinduism. They are probably as older or even much older than Vedism. In addition, there were many other traditions and ascetic movements, some of which became part of Hinduism, while some disappeared. Vedic people worshipped Brahma and 33 other gods through sacrificial ceremonies and daily sacrifices. They regarded them as the manifestations of Brahman, the highest, supreme God of the Vedas. They believed in a four tier world, and regarded the Sun as the home to the immortal and liberated souls, and the moon as the abode of the ancestral souls who were subject to rebirth. In the sacrificial ceremonies, the Vedic kings worshipped Kshatriya gods such as Indra, Varuna, Mithra, Soma, Vayu, and paid their homage to Brahma or Prajapathi, the ruler of the three worlds. The Brahmanas took leadership of the ritual Vedism, and mainly focused upon the knowledge of the Samhithas, Brahmanas and Aranyakas, from which the philosophy of the ritual based Purva Mimansa emerged subsequently. In the rituals they worshipped Agni and made their offerings to him. The Vedic kings contributed to the knowledge of the Upanishads, which later on led to the origin of the school of the Vedanta, or the Uttara Mimansa. In both its ritual and spiritual practices, the Vedic religion acknowledged Brahman as the highest supreme Self and the ruler of the universe who manifested as other gods and the entire creation and who was the ultimate recipient of all sacrificial offerings. The Brahman of their conception was a mysterious silent God, who facilitated the sacrifices but was not dependent upon them like other gods. Vedic religion had no tradition of temple worship or the domestic worship (puja). This practice was common to the other three namely, Shaivism, Vaishnavism, and Shaktism. The earliest temples of Hinduism were probably caves such as the kind we see at Amarnath or Vaishnavadevi. These gods enjoyed the royal patronage of native kings who ruled the rest of India from the Himalayas, the Gangetic plains, and East Coast, to deep South. They were probably unaware of the Vedic tradition for a long time and practiced different methods of worship and sacrifices. Bhakti or devotion, which is not found in Vedism, was a common feature to the three traditions. People expressed love and devotion to their personal gods Shiva, Vishnu, and Shakti at home through domestic worship (puja) and in the temples through more structured rituals such as arathi, archana, sthothrams, bhajans, japam, dhyanam, etc. The earliest temples for these deities, probably open, stupa like structures, or wooden temples, were built on the banks of the rivers so that people could take a bath in the them and cleanse themselves before entering the temples. When the temples were built at other places, especially in the South, it became necessary to build public baths, or large water tanks (Kovela) near the temples to facilitate the same. In all the three traditions, the chief deity is worshipped as the highest supreme Self who is both the creator and the created. Each of them has numerous manifestations, aspects, emanations, associate deities, and an army of warrior gods and goddesses. Each of them has his own heaven, like that of Brahman. Vishnu's heaven is Vaikuntha, Shiva's is Kailash, and Shakti's is Tripura. They are very different deities in nature, power, and manifestations, but they also have a lot in common with regard to their highest aspects. The Vedic kings who invoked Brahma and other Kshatriya gods for protection, peace, prosperity and victory in wars, traced their origin from either the Sun or the Moon. The two celestial bodies represented constancy and impermanence respectively. The sun represented the immortal power of Brahman. The moon represented the waxing and waning power of the gods who required constant nurturing by humans to stay strong. The tradition of tracing their ancestry to these two deities has been continued by subsequent generations of kings and princely families until modern times. It appears that about 2000 B.C. the Vedic civilization and the remnants of the Indus Civilization collapsed, creating a major upheaval in that part of the world, and setting in motion an unprecedented migration of people. We do not clearly know what contributed to it, but it seems climate change and drying up of the rivers played an important role. It forced the people to move eastwards and southwards. They were joined by the priestly families, as they lost their traditional patrons (yajamanas). In the new lands to where they migrated they had to find new patrons and adapt to their ways and belief systems. It was probably around this time that the integration of Vedic religion with other streams of Hinduism took place, resulting in a composite faith, that eventually shaped into what we have today as main stream Hinduism, or Sanatana Dharma. The integration was a significant event in the history of Hinduism. It preserved the main beliefs and practices of all the four traditions, creating in the processes an expanded universe of gods and goddesses, in which each of the three gods, Brahma, Vishnu, and Shiva, represented both universal and individual aspects. Shakti, the Mother Goddess, joined them as their associate power as well as the Universal Mother and Creator above all. Probably the rise of Buddhism and Jainism consolidated the integration as they constituted the common foe for the four. The integration preserved the distinction of the four, while uniting them against common threats. For example, the Vedic of tradition of worshipping gods through rituals and sacrifices rather than through devotional worship continued even after the integration, while the other three kept their tradition of devotionally worshipping their gods through domestic and temple rituals. As a result, today we have in Hinduism both practices of sacrificial worship and devotional worship. It uphods, both complex rituals which require the assistance of qualified priests, and simple domestic worship of offering prayers and devotion, which can be performed by any individual without much ritual knowledge. To this day, Vedism does not place as much emphasis upon devotion as upon the obligatory duties humans have towards gods, ancestors, etc., through sacrifices (yajnas). In contrast, devotional theism (bhakti) is an important aspect of the other three traditions. Hence, we do not find individual temples for the Vedic gods such as Indra, Varuna, Soma, Mitra, etc., except as Dikpalas (space deities), or the practice of worshipping them with devotion. Even they are worshipped out of fear rather than devotion, to ward off their evil and negative influence. For the same reason, we do not find many temples for Brahma, although he is extolled in the Vedas as the creator and ruler of all beings (Brahma Prajapathi), and placed next to Brahman in importance. Brahman himself is not directly worshipped in any Hindu temples, since there was never such a practice in Vedic religion from the earliest times. He is exalted and spoken highly in the scriptures, but not worshipped personally in devotional terms. It is a mystery because every god in Hindu pantheon, including Vishnu and Shiva, is considered an aspect of Brahman only, and receives more love and devotion. Thus, we can see that Hinduism has not directly descended from Vedic tradition only, but from at least three other major traditions of ancient India, namely Shavism, Vaishnavism, and Shaktism. If you want to understand what factors shaped the present day Hinduism, you have to study them all. From the study you will further realize that present day Hinduism has very little in common with the ancient Vedic religion compared to the other three traditions, which seem to represent the bulk of its beliefs, philosophy, and practices. The Vedic gods now occupy a less exalted position compared to even secondary gods like Hanuman, Ganesha, Skanda, Narasimha, Kali, Rama, or Krishna. From the above it also becomes clear that Hinduism is not a religion, but a multi-religious system consisting of at least four major religious traditions, namely Vedism or Brahmanism, Shaivism, Vaishnavism, and Shaktism. Besides numerous folk traditions, village and rural deities, and ascetic traditions are part of it. Their presence and numerous influences make Hinduism most difficult to understand and generalize. It also makes it very difficult to justify any social or religious practices or ethical behavior of modern times, such vegetarianism, banning of meat eating, or prevention of animal sacrifices. To understand the true spirit of Hinduism, we must consider all the four. For example, we cannot use the Vedas only to justify any social or cultural practice. We must look for confirmation in Shaiva and Vaishnava literature also. If there is a variation, people must go by which deities they worship and what the deities expect from their followers. Some of the practices in Tantra are decidedly antisocial. They cannot be used to brand the whole religion or suggest a common code of conduct. They apply only to those who are willing to take risks and put their liberation and spiritual destinies on the edge of a sword. Each person on earth is responsible for his or her spiritual destiny. You cannot take responsibility for them. You may tell them what is right or wrong, but you cannot take responsibility for their actions and their consequences. The four major traditions have a lot in common. Hence, it is easier to find a common ground and identify as them as one. For example the following are the major beliefs and practices that are common to the four traditions. It is possible that they did not have all these features in common in the remote past, and might have acquired them during the integration. Belief in renunciation, detachment, self-control, and celibacy as the means to liberation.